IFA 2014: Crystal Acoustics unveils Reference wireless speakers with WiSound technology | What Hi-Fi? 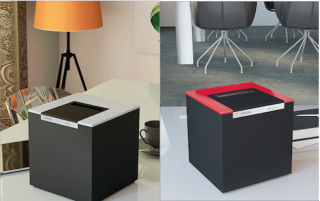 Crystal Acoustics has unveiled its latest range of wireless speakers that come with the recently-developed WiSound technology that "pledges to improve wireless speaker sound". The Reference series comprises standalone music speakers, two soundbases and a soundbar. All of which use WiSound technology. By incorporating WiSound, the speakers aim to provide a 360-degree soundfield and eliminate the "sweet spot" found on other speakers. The first speakers to become available are the Cuby 7 and Cuby 5. Both benefit from apt-X Bluetooth compatbility, a high-quality Class-D amplifier and a range of colour finishes. The Cuby 7 features seven drivers of various designs. These fire sound forwards, upwards and sideways to create a "balanced set of reflections". The Cuby 5 meanwhile has five drivers. The Reference series can be used in a multi-room set-up by simultaneously using Bluetooth and wi-fi, without the need for a 'bridge'. Both the Cuby 7 and Cuby 5 are due for release in October for £299 and £219 respectively. Meanwhile, WiSound technology has yet to receive a full market release, but a full range of products is expected before the end of the year. It works by combining forward-, up- and side-firing drivers of various sizes and frequency ranges to combine direct and reflected sound.